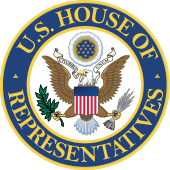 The United States House of Representatives is one of the two (2) houses of the United States Congress (a bicameral legislature). It is frequently referred to as The House. The other house is the Senate. Each U.S. state is represented in the House in proportion to its population as measured in the latest census, but every state is entitled to at least one representative. Each representative serves for a two-year term. Blanchard is served by U.S. Congressional District No. 4, which is served by Representative Tom Cole, R.
More information regarding the U.S. House of Representatives.